Thinking of buying a registered bull to use on commercial cattle and sell cows for higher than a non registered bull.Friend has one not quite ready yet (7 months old) but will sell to me for $1,000. I know nothing about epds I have included a pic of him and his epds. What you all think thanks. I'm not big on high CED low BW for mature cows, there's bulls out there that could put more performance into your cows, overall he's ok.
What type bulls have you been using? If you've just been using commercial type bulls, he may put some consistency in your eventually cows and make them worth a little more, that's a big unknown. Price is right on him, he needs 8 more months of development if you have the place and time for that, other option turn him out, not sure he will develop very well like that. Unless you sell private treaty it won't make a difference if they're bred by a registered bull. Even then, a lot of people running commercial could care less. Got the t-shirt! Nice bull, pretty good calving ease. At 7 months he's not ready to breed and he hasn't fully developed his generic bloodline and that (appearance) can be misleading at this age......somewhat. However even at that he is too muscular, too short lengthwise.....not enough loin (where the money in steaks is), legs long making it easier to reach tall cows when breeding but usually shorter, and not all that thick in the mid body, again where the money is in the steaks ( Rib Steak (eye), T bone, Strip Loin, Filet Mignon, Club, Top Sirloin) . Remember the bull is half the herd and a good bull can deliver swell calves from a mediocre heifer/cow. In today's marked $1k for a registered yearling is a super price even if he's not what I'd be looking for. "My hopes is not to play the sale barn game and make a little more private sale." It's not all that bad. My last herd bull was "grade" Angus with just enough Brahman to get a little ear, surely not the ⅝-⅜ registering amount, 3 years old and brought $3200 at the Durant Ok. Stockyards. I wouldn't call that gaming. I never went with registered stock as I was always a STO and didn't have the volume nor resources to entertain the crowd at a full blown fully registered stock sale. So my market was the barn and it served me very well over the 40 years I have been attempting to be a farmer/rancher. No way you can judge REA on a profile and I'm not sure it can be judged in any other view without ultrasound. You are forced to look at other muscles, as in the front leg to have an idea of thin or thick muscled but that does not always work. Never heard of a "generic bloodline", either. Not sure why you'd want him to look like a gutty calf as depth of body is OK. Not too sure that "short body" and "long legs" is more than an illusion. I'd rather have proper feet, flat back and good rear leg angles than the shifting or hip angles and other bones to get a long look and a swayback nag look. Dr. Robert Long at CSU developed that issue into some good research years ago. If folks would study a bit the Angus breed would walk and stand normal with a good topline for a longer useful life. Pedigree is "modern". You'll need to find somebody who seeks that to know the issues of those lines. What’s more profitable registered cows/bulls private sale or commercial cows/calf’s at sale barn? Because you have a registered bull doesn't mean you will have registered cows!!! The calves out of that bull will still just be commercial if you have commercial cows. If you have a registered herd, sometimes there's a premium there, you do have 2 different options of selling, purebred(doesn't happen over night) or sale barn. With commercial most of the time it's sale barn, with the right market and time you could possibly sell a few commercial bred heifers if you can manage them for that long. 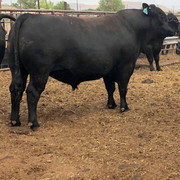 Lrj505 wrote: Thinking of buying a registered bull to use on commercial cattle and sell cows for higher than a non registered bull.Friend has one not quite ready yet (7 months old) but will sell to me for $1,000. I know nothing about epds I have included a pic of him and his epds. What you all think thanks. Keep the bull you have. Lrj505 wrote: What’s more profitable registered cows/bulls private sale or commercial cows/calf’s at sale barn? If you have to ask on here about rather or not you should buy a particular bull you better stick to commercial cattle. and that (appearance) can be misleading at this age......somewhat. However even at that he is too muscular, too short lengthwise.....not enough loin (where the money in steaks is), legs long making it easier to reach tall cows when breeding but usually shorter, and not all that thick in the mid body, again where the money is in the steaks ( Rib Steak (eye), T bone, Strip Loin, Filet Mignon, Club, Top Sirloin) . His bloodlines aren't what I might look for but I wouldn't consider them generic. Have looked at some nice bulls with very similar breeding. Why do you call his breeding generic? Why do you say he is too muscular. If he is I'm afraid to say even those of ours I think needs more muscle are more muscular than he is. Not saying anything bad about him but guess it shows how 2 people can look at the same animal and see them totally different. Why the same animal don't win every show. We all see them a little differently. Last edited by elkwc on Tue Aug 21, 2018 9:20 pm, edited 1 time in total. If you need another bull he is very reasonably priced. At least for what prices are in this area. I feel the older bull is a solid bull from the pics. But from pics and with the difference in age it is hard to compare the 2 bulls. He is priced cheap enough you could grow him out for a while and see how he develops.